Pizza is a key product of Italian cuisine. Originally from Naples, it is worldwide famous. The term probably comes from “pinsa”, the past participle of the Latin verb “pinsere” which means “to flatten”. 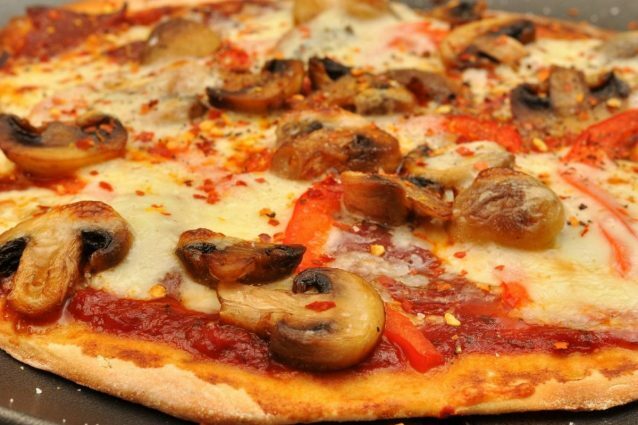 With the help of this recipe, you can make pizza at home easily. How many different types of Italian pizza are there? There are three types of Italian pizza: round pizza, which is made with a mixture of water, flour, yeast, oil and salt; pizza “al taglio” (“by the slice”), also called pan pizza, stretched, seasoned and baked in metal rectangular pans, and eaten in slices; pizza cooked with a peel, similar to pan pizza, which is sold by weight. It is often called pizza “a metro” (“by meter”). It is not possible to list all the different combinations of pizza toppings as they are too many to count, but some of them are really tasty and special. Besides the classic margherita, marinara, capricciosa, there are also regional variations, based on seasoning, such as Roman-style or gluten-free pizzas, whose dough is made with wheat-free pizza flour, with ingredients suitable for people with coeliac disease. Pizza, especially when homemade, can be made even with mother yeast, which is natural yeast. Anyway, pizza is in itself a low-calorie food and only the right fermentation of the dough makes it digestible. According to the authentic Neapolitan recipe, pizza is baked in a brick bread oven, heated with wood bundles. But since we want to make it at home, we must settle for a good electric oven. As for the ingredients for the dough, we’ll just need 700 grams of flour for 50 grams of yeast with the addition of water and salt to taste. Make a well in the center of the flour and add yeast with salt. Use lukewarm water to blend the dough. Add the water gradually and knead the dough by hand until soft, but compact. Let the dough rise in a dry place, after dividing it into equal parts. The original pizza recipe does not include the use of “tips”, but adding a teaspoon of sugar to the dough will make it rise faster while saving some time. Once your loaves have risen, knead them one at a time. The pizza should be round, but it depends on the pans you have at home. Drizzle a little olive oil over the pan and add the dough. All you have to do is put the seasoning: if you want pizza margherita, prepare tomatoes, mozzarella, oil, salt and basil. Preheat oven well and cook on static at the maximum temperature for about fifteen minutes. Retire from oven. In fact you have to put the dough into the oven only when you feel that the oven is very hot. Prefer conventional oven over fan-assisted oven. In the latter case the cooking will dry the pizza too much, making it twice-baked (as you will have to lengthen the baking time). Otherwise, it might look very soft inside, almost raw. For an electric or gas oven, the temperature should be between 300 and 320 degrees Celsius, for a wood oven it must be around 450 degrees Celsius. Let’s start from the pan: it must have very low edges (max 1.5 cm) and, as for the amount of flour to use, follow this ratio: for a round 28 cm baking pan, use 280 gr of flour; for a 30 cm pan, use 320 gr, for a 32 cm pan, use 365 grams of flour. Then you’ll need to multiply the centimeters of a single pan and divide by 2.2 to get the ratio of flour. As for the baking of the pizza, bake it on the bottom rack of the oven. If you are making a pan pizza, bake it in the middle of the oven. Another problem with homemade pizza can be encountered when the pizza is put into the oven: when opening the door, accumulated heat is dispersed and, for this reason, we recommend using a refractory stone (or four bricks) on the bottom of the oven. If you have an electric oven, place pizza on top rack, next to the resistors, but if you’re baking it in a pan, during the first part of baking, bake it on the bottom rack while, for the remaining time, bake it next to the resistors so that you have a high, soft and tender pizza. Use peeled tomatoes to be seasoned with olive oil, salt and basil. Mozzarella cheese must be fresh: avoid buffalo mozzarella. As for the vegetables, first put them back in the pan, then add them to the pizza but, if you’re using an electric or gas oven, add them only at the last minute. How do I get a softer pizza crust? The secret lies in the dough. You have to stretch the dough from the center and move outwards until the thickness is about 4 cm. Be careful not to crush the edge so that it can grow. How long should homemade pizza dough rise? The dough must necessarily rise double in volume, so fermentation time must be at least three hours. Cover the dough with a small blanket. When should I add mozzarella? With a long baking time, mozzarella should be added at the end of baking. If you’re baking with a wood-burning oven, you must add it immediately. Why pizza dough is not rising and what should I do? The two factors that could affect rising are yeast and flour. 25 grams of yeast for 1 kg of flour are needed. Dissolve yeast in lukewarm water, and, as we have already told you, use a teaspoon of sugar to speed up rising. Flour mixed with water must get elastic: manitoba flour will help rising because it has a high amount of gluten, so mix it with normal flour. Finally, the water temperature must be forty degrees Celsius. What if the pizza is not rising? Put the pizza in a warm place (next to the oven is okay) or use instant cake yeast. Remember that these steps are critical to not have a chewy or hard pizza. If you plan to use the dough within a couple of days, we recommend that you keep it in a refrigerator inside a large container, however, it should be kneaded before you cook it. If you do not want to eat it right away, freeze the dough, but first, divide it into equal parts, cover them with parchment paper and then wrap them in aluminum foil. When you want to use the frozen pizza dough pieces, remove them from the freezer, remove aluminum foil and parchment paper and let them defrost in your refrigerator for a few hours or at room temperature. Otherwise, you can also use your microwave to defrost them. Meatball stuffed pull-apart bread: this brilliant idea is perfect to serve as a starter at your next dinner party!